When I left you last night, I promised there would be news of chickens, fermented shark, and our collective expansion of our personal comfort zones. I suppose I ought to start with the chickens. On the morning of our second full day in Iceland, our host/landlord knocked on the door of the cottage and informed us that he was going to be away for a few days visiting family. Did we need anything before he left, he inquired politely? Oh, and had we noticed the chickens? Of COURSE we’d noticed the chickens. Three of them, beautifully fat, content, and bold, had the run of the yard. 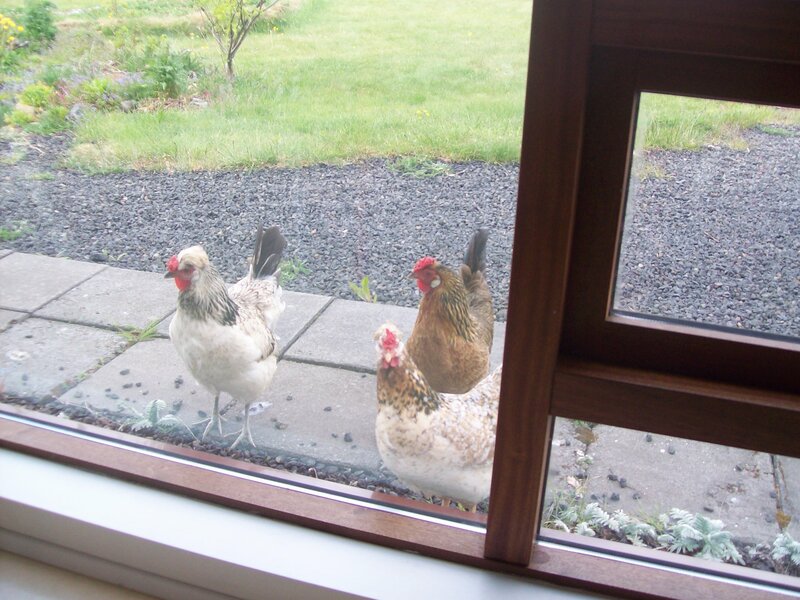 They liked to commandeer the front stoop of our cottage and peer suspiciously in the windows at us in the mornings. 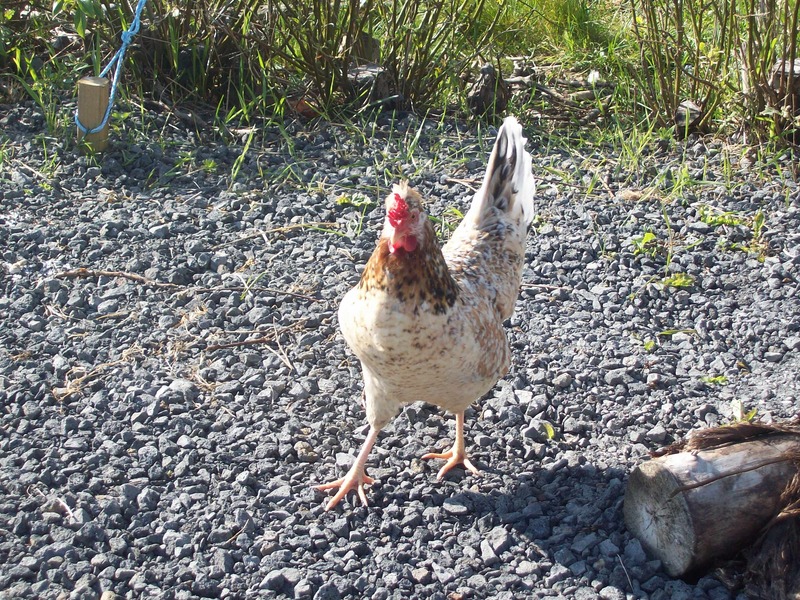 Their squawks – unaccustomed noises for my urban ears – woke me from a deep sleep almost every day in some murky terror of Chicken-Monster Intruders storming our efficient little IKEA-strewn paradise. If we’d LIKE? B.W. and I practically dashed out to the coop with him to receive the tutorial on gathering the eggs and leaving kitchen scraps in a chicken-sized food trough. The scraps, he told us, weren’t at all necessary since the hens fed themselves from the abundance of insects available to them as they roamed. But “I suspect they like me better if I treat them,” he chuckled. Poultry responsibilities thus conferred upon us, we triumphantly installed the first three glorious, saffron-yolked eggs into the little refrigerator and waited for more. In the meantime, we decided we ought to name the creatures who were trying so desperately to share our morning muesli. Divas, we proclaimed, watching them strut. Ethel. Barbra. Celine. The divas provided us with just shy of a dozen lovely treasures over the course of our chicken-sitting undertaking, possibly prompted by our regular gifts of kitchen scraps and bread crusts. I used some of the eggs to make the carbonara knockoff I shared yesterday; Big D. pressed several more into service making French toast for us one morning, which we smeared with raspberry jam. The rest were hard-boiled and eaten rapidly, as all good fresh, pastured eggs ought to be. “This is doing nothing to curb my desire to raise backyard chickens if it ever becomes legal back home,” I said to J. He patted my head and said nothing. Sometimes I have to remember that J.’s being shoved along on this mad adventure that is my life. Beyond the dramatic awesomeness of chicken-herding (If that’s not what it’s called, it should be), our meals became positively lackluster as the full impact of our limitations became apparent. For someone like me, who practically lives on produce (especially at this time of year), the whole concept of being basically without vegetables and fresh fruits, not to mention restricted in our consumption of meats and fish, was more than a minor inconvenience. My whole BODY went into rebellion. Granted, we were doing a lot of walking, hiking, and driving through the countryside, so the grab-and-go picnic of bread and cheese with dried fruit was certainly the most convenient thing we could do most days. After three days of that menu, however, I was ready for a break. So, to be honest, was my digestive tract. Yes, that’s a sign for the WORST (read: MOST AWESOMELY HILARIOUS) supernatural museum ever. Low-budget props, bad narration, and super-unscary local kid in a dusty costume, included in the price of admission. Clearly we didn’t pay nearly enough for the privilege. We were able to find this particular gem of a tourist attraction thanks to B.W.’s foresight in bringing along a hefty Frommer’s guide in her backpack. As we traveled down along the south coast in a bid to see what the less-populated parts of the country would have to offer, it became eminently clear – from the Frommer’s guide, henceforth to be known as “the Bible,” – that we had to stop in the tiny town of Stokkseyri, population 499. It promised us not only the fabulously awful museum, but also the best lobster soup in the world. No, I’m not kidding. It’s the BEST LOBSTER SOUP IN THE WORLD. You may be dubious. That’s okay. But the Bible claims that people drive to Stokkseyri from Reykjavik just to eat this soup (that’s about an hour’s drive for dinner, from a city teeming with restaurants), and I’ll believe it. 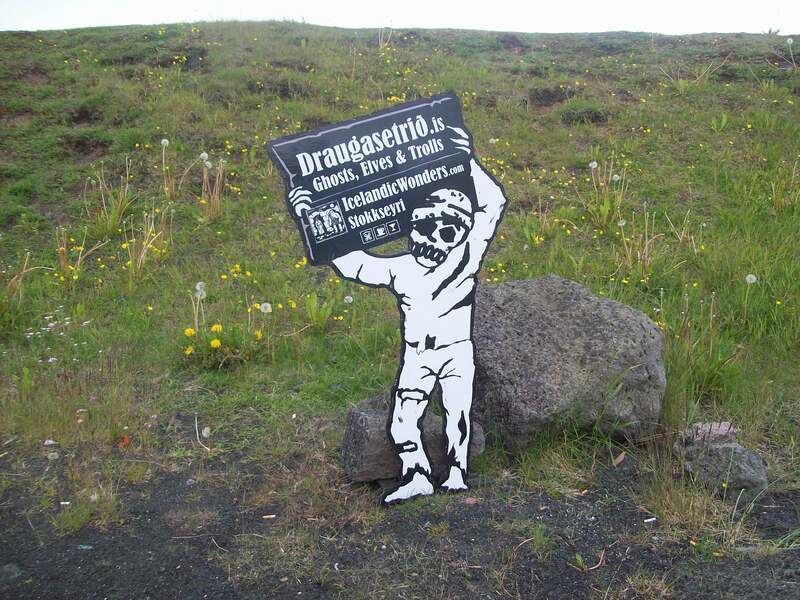 We walked across the gravel parking lot from the ghost museum to the front door of the restaurant, passing a group of teenagers tending to the grounds; we would later discover that all Icelandic teens are given similar jobs in the summertime by their local municipalities, which would explain how mind-blowingly spotless and well-manicured everything appeared to be while we were there. Once inside the place, we were presented with a menu of exactly four dishes – thankfully, it was offered in both Icelandic and English. We were also informed by our waiter that everything on the menu would be served with homemade bread and “dips.” I cannot possibly stress enough how amazing these “dips” were, and how much in particular the “Sweet Garlic Dip” has consumed my waking thoughts ever since devouring far more than was ladylike. The fact that I was even willing to EAT bread at that point, after groaning about too much starch for three days, is testament to the power of the bread dip. (Once I figure out how to replicate the stuff, you’d better believe I’m sharing the recipe.) But then the soup arrived – in steaming bowls – along with a TUREEN in case we needed seconds or thirds. I could have bathed in it. As J., B.W., and I splashed about in our crustaceous heaven, Big D. – eating what he said was a quite delicious salad with cheese and beef carpaccio – contemplated us. He’s not a seafood eater, a preference that was, to be honest, a little bit more challenging for all of us given the fact that Iceland basically runs on seafood. 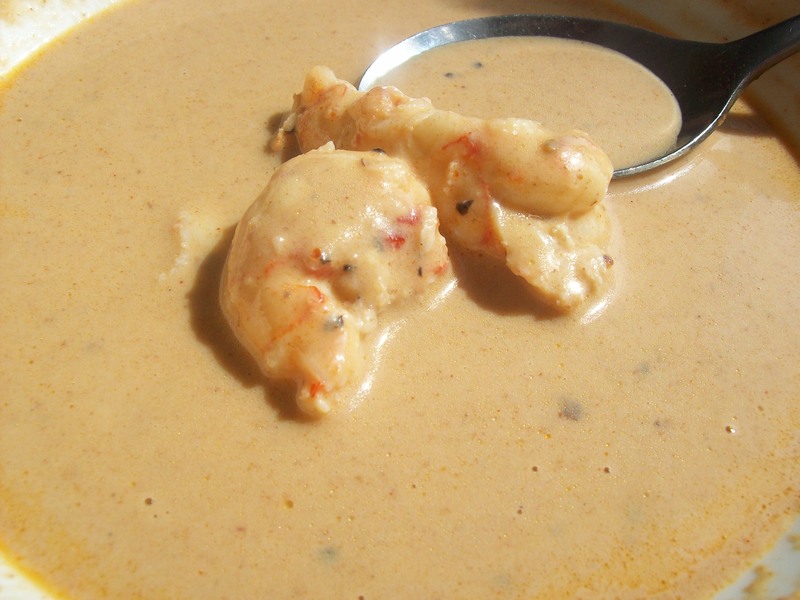 But at last, with B.W.’s encouragement, Big D. gave the soup a try – chunk of lobster and all. He was right in a few ways; first of all, it was perfectly cooked, so much so that tasting it and realizing how velvety the texture was has convinced me that I’ve never had a perfectly cooked piece of lobster before. It was also a smaller, sweeter lobster than the ones we New Englanders are accustomed to eating. And it was FRESH. Startlingly fresh. Un-fishily fresh. I recognized that kind of freshness because we’ve only just begun to appreciate – and expect – it in our own home, thanks to the Community Supported Fishery share J. and I get from our neighborhood farmer’s market. The fish we get there is caught on Friday and sold to us on Saturday morning, and tastes nothing like any other fish I’ve ever bought from even a good seafood market. Of course, if you add in to this whole equation the overall purity of the Icelandic water and food supplies, you can understand pretty easily how quickly somebody might be won over by a single bite of lobster soup. Once Big D. realized that there’s seafood, and then there’s SEAFOOD, he was more game to try whatever was on offer. Of course, I was still somewhat surprised when he and J. got right in line for the Granddaddy of all seafood experiences: Hakarl. Hakarl is THE Icelandic regional delicacy; it’s the thing people are dying to know about when they hear you’re going to, or have been to, Iceland. And yes, it’s putrefied (some would say the proper word is “fermented”) Greenland shark. I’m usually up for just about anything and had figured I’d give it a try if the opportunity presented itself; when the opportunity did just that, in the form of a shark fisherman we ran into in a gift shop down at the Old Harbor in Reykjavik, I have to admit I chickened out. But J. and Big D. marched bravely to their doom (I mean, towards the shark) as it lined up in Dixie cups across the counter. They slugged down the shots of “Black Death” (also known as brennevin, Iceland’s answer to aquavit) and thanked the fisherman, then headed back to B.W. and me with looks of manly triumph, or possibly repressed nausea. “It wasn’t as bad as I thought it would be,” J. said as he reached my side. I gagged and stepped rapidly back from him. I’m not particularly squeamish – I’ve eaten haggis and would happily do so again – but YOU GUYS. The smell of this stuff, once on someone’s BREATH? I can only describe it as what I think the interior of Jaws’ stomach lining must smell like. “Did you eat a whole chum boat?” I squeaked, as B.W. also backed away hastily in horror. Once we’d convinced them that it really WAS that bad, and they’d consumed approximately several dozen Altoids, we let them sit next to us again. But I’m not going to lie – I wouldn’t allow J. to kiss me until after he’d brushed his teeth that night. With the lid off the Pandora’s box, so to speak, Big D. graciously agreed to try eating some salmon if I cooked it for all of us. It was a relief – salmon was easily purchased at both the Hagkaup and the Bonus market, another grocery chain we tried in the vain hope that there would be some better-looking produce available to us. In fact, shockingly, the situation at the Bonus was WORSE. B.W. and I stared numbly at floppy carrots and mushy peppers before finding a head of cabbage that didn’t look as though we’d have to peel all the outer layers off it to make it edible. It was fine. It was actually pretty fantastic, despite the fact that I was inept with the stove in our cottage and nearly scorched the potatoes. 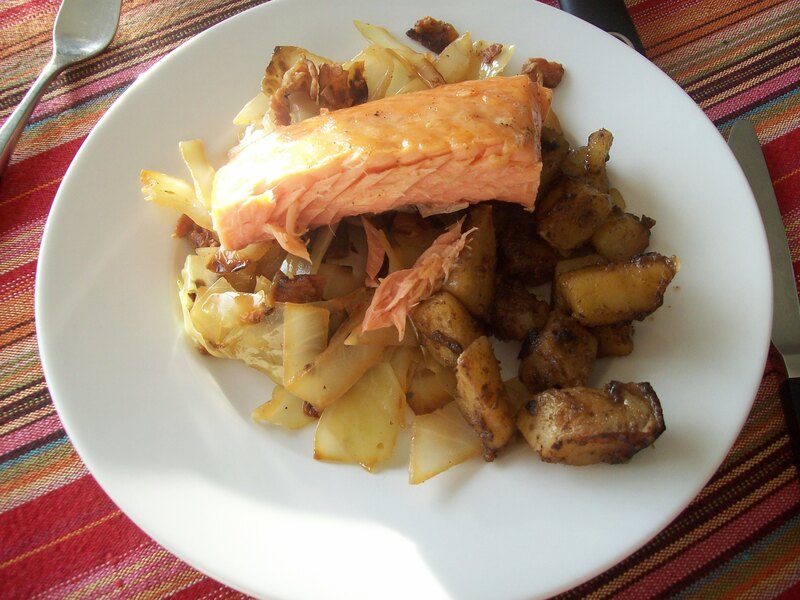 The salmon, seasoned simply with salt and pepper and seared in a cast-iron skillet, had a vaguely smoky flavor which was picked up by the bacon-cabbage-potato combo beneath it. B.W., J., and I fell to it and ate every scrap. Big D.’s verdict was that “I wouldn’t necessarily seek it out again, but I have no problem eating this.” Obviously, after putrefied shark, almost anything probably would have been preferable; but I chose to take it as a compliment. Nearly through our Icelandic adventures…but I still haven’t told you anything about the pastries, the hot dogs, or the minke whale! Damn the luck. Stay tuned for the third and – I promise! – final leg of the journey after tomorrow’s July meal plan. This entry was posted in Cooking, Food culture, Meal planning and tagged chickens, cooking, food, holidays, Household organization, Iceland, meal planning, milestones, travel. Bookmark the permalink. i’d highly recommend the book…but not if you’re feeling nauseated when you read it!